Air India has ordered 27 of them, Jet Airways another 10. Most of these aircraft should have begun commercial operations by now, but not one has yet been delivered. Boeing's new 787 Dreamliner has been inordinately delayed. The ambitious plan that called for 787 parts to be flown in from various places across the world and assembled at Boeing's headquarters - body fuselage barrels from Italy, wings from Japan, landing gear from France - has come unstuck. The first 787 will be delivered this winter, three years behind schedule, to Japan's All Nippon Airways. Air India will get its first four aircraft by March 2012 as soon as their interior fitments are complete. But the wait is worth it. The 787 still marks a major advance in the 108-year history of powered flight. Just as the 1930s saw the move from fabric and wooden airframes to allmetal aircraft, and the 1950s the dawn of the jet age, the construction of the Boeing 787 in this decade marks a turning point in the way planes are manufactured. Not by bending and riveting giant sheets of aerospace-grade aluminium honeycomb any more, but from plastic. Carbon-Fibre Reinforced Plastic, or CFRP, or better still 'composite materials' as it has come to be known, is the same material that has been used to manufacture Formula1 cars for the past decade. But it is one thing to make a single-seat, high-performance sports car that races in a controlled environment, and quite another to manufacture a $200-million aircraft that carries up to 250 passengers and must be built to survive at least 20 years in the sky. The process starts in a very large oven at the factory owned and operated by Alenia Aeronautica in south Italy's Grottaglie province, where layers of carbon fibre are baked to form the fuselage sections. These sections and other components from across the world are transported by a giant converted Boeing 747 freighter to Boeing's final assembly line at Everett in the state of Washington, US. Walking down the aisle of the 787 that landed at New Delhi's Indira Gandhi International Airport recently was an experience in itself. The aircraft is in India to be showcased to Air India and Jet Airways, both customers. One curious feature: there are giant barrels of water stored in rows under high pressure inside the aircraft, which enable the 30 engineers on board to constantly change the centre of gravity of the plane while in the air. 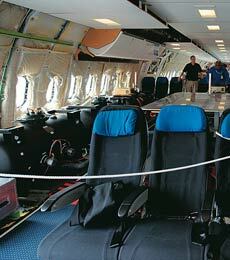 The composite construction of the 787 also allows for much larger windows than in traditional aircraft. The windows do not have the usual shades; piezo-electric crystals inside them make them acquire a tint at the turn of a knob. Again, the non-corrosive composite structure allows the air-conditioning to run with some amount of humidity, so the air inside is not as dry as in other aircraft. The absence of metal, and resultant lack of metal fatigue, also allows operators to keep the aircraft pressured at lower altitude levels. 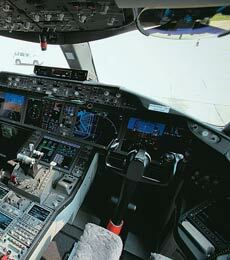 "Passengers will realise the advantages of flying the 787 when they are inside. 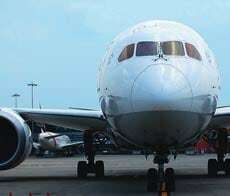 It will be more comfortable than any other plane," says Boeing India President Dinesh Keskar. However, as with all things new, the 787 has faced its share of criticism. Some experts have questioned the composite construction, and debated how well - or badly - it will withstand accidents. There have also been questions about how easy or difficult composite structures are to repair, given that aircraft, like cars, inevitably develop problems at some point. That said, Boeing's rival, the European manufacturer Airbus is also developing its own fully-composite plane - the Airbus A350XWB. 1949: Following the massive advances in military aviation during World War II, the British-made de Havilland Comet, the world's fi rst civilian jet aircraft is born. However, a series of Comet accidents sees the American Boeing 707 win the jet battle. Maradona does a Hand of God again!